Okay, so you’re probably thinking, in response to the title of this blog post: Hey, wait a minute! Who do you think you are? You don’t even know me! How can you possibly think I want to start a food blog? Well, that’s true. I probably don’t know you, but I bet you like to eat…at least enough to keep yourself alive. And if you’re a mom or a dad who is responsible for fixing meals for a family, you probably spend a lot of time thinking about food…way more than you realize. This is even true for you if you’re only responsible for cooking for yourself, because cooking for one person is especially challenging! Food blogging is a natural extension of thinking about and consuming food for the person who likes to write…and even the person who doesn’t necessarily like to write because it’s not all that hard. 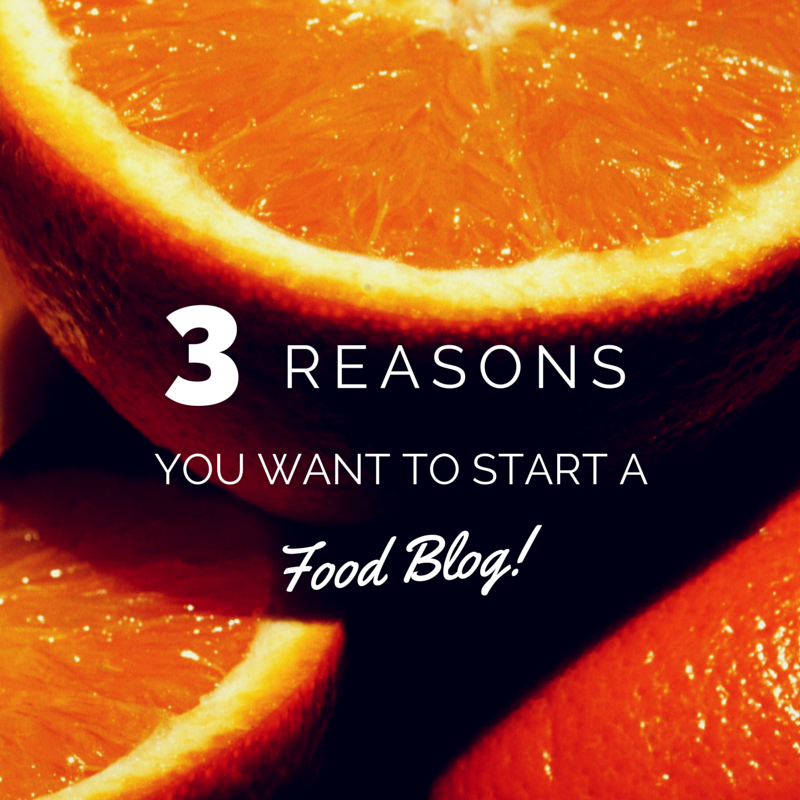 So, here are 3 reasons you might want to start a food blog. 2. You don’t have to have any specialized knowledge to write about food. Since everybody eats, everybody has favorite and not-so-favorite foods. Everyone has favorite recipes or meals they can share with the rest of the world…or even horror stories about burning water (as my husband has done before) or making the worst-tasting carrot cake in the history of the universe. I have my own horror stories about trying to make my own donuts and Jell-O Candy (a post I’m saving for another day). In short, EVERYONE is an expert about SOMETHING food-related, and that makes it easy for you to share your knowledge and experiences with others. 3. Food blogging can be rather lucrative. Many people are making a living with their food blogs, like Tracy Roberts (although her blog deals with more than just food). Then, after you have enough recipes posted up on your blog, you can take those posts and create a cookbook to sell on Amazon. And you can make even more money by setting up an affiliate program, where other people can get a cut of the profits by selling your products for you. Plus, you can even sign up for other people’s affiliate programs and make money by promoting food-related products on your own blog! I bet you’re thinking, by now, that starting your own food blog is sounding pretty good, right? Of course it is! And one of the best resources for starting out (it’s FREE, by the way) is Foodaplenty’s 50 Easy Ways to Grow Your Food Blog (yes, this is an affiliate link – I’m taking my own advice and promoting other people’s products). So, if you’ve ever wanted to start your own food blog (or if this post has inspired you), you’ll want to download this guide today. Just click on the link above. And, for some extra motivation, join in the Foodaplenty August Food Blogger Challenge by clicking on the picture below. It’s free to join, and the prizes are spectacular! After you’ve read the free report listed above, you’re going to want to take your food blogging to the next level by checking out Telling Your Stories Through Food Blogging. This invaluable resource helps you discover your own food stories and connect them in a real way with your audience for maximum effect. And it’s only $11.99!